UTC Warrington is an inspiring and professional learning environment that gives young people the technical skills, expert understanding and personal aptitude and qualities they need for successful careers. UTC Warrington has a business-like feel in every aspect of college life. It is embedded throughout all aspects of the college from the curriculum and the 8:30am – 4:00pm working day, including technical projects and enrichment activities. Students earn reward tokens based on the 5 elements of the PiXL EDGE personal development framework; leadership, organisation, communication, initiative and resilience. 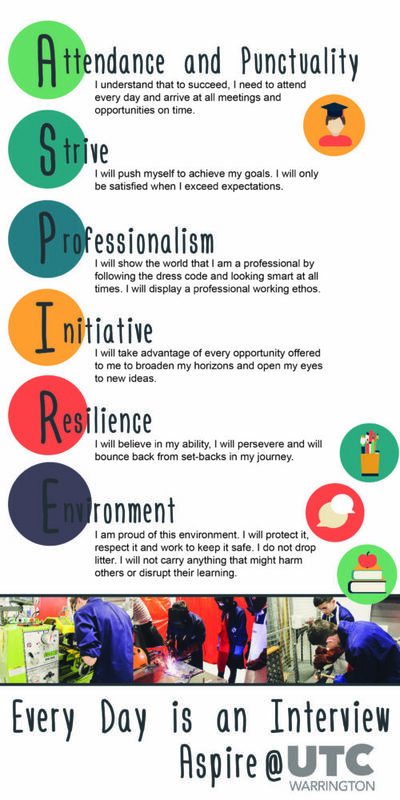 The PiXL Edge is a framework designed for schools and colleges to develop and accredit in students those personal attributes essential for employability and life. The PiXL Edge framework underpins all activities at UTC Warrington and is used by staff to encourage and track students’ development. The curriculum reflects the need to consider progress in core subjects such as English and Maths, whilst developing specialist knowledge and understanding in technical options. Learning is supported and contextualised by our employer partners. Students have access to a wide range of learning experiences, working with teachers, fellow students and professionals. They have opportunities to apply their learning disciplines to project based challenges that develop their employability skills.